When T’Challa prepares to go into battle to rescue his love Nakia, Okoye grabs her spear to go into battle with him. When he tells her that he can handle “this one” - although she doubts he will remain focused she allows him to move forward and reminds him “don’t freeze.” Okoye allows him to fight without ever giving any inclination that she is near. And as she thought, then he froze up, doing the very thing that she tells him not to do (why don’t y'all listen?). She saves the day with an effortless blow and backhand jab. She is more than your general, she is your friend who is willing to do what it takes, even if you don’t know it is what you need, to keep you and your love safe. To have a platonic relationship that exudes trust and protection would undeniably take you to new heights throughout your life. Can we please stop and acknowledge the calculating ability it would take to throw a spear through the windshield to penetrate the concrete and stop a whole SUV? Just FIRE! Let us also note that in the scenes were T’Challa was challenged by M’Baku and Killmonger; you can see and almost feel her sending strength to T’Challa. She stayed poised and powerful from beginning to end. We can’t help but acknowledge her character is grossly parallel to the Benin warrior, Seh-Dong-Hong-Beh. Seh-Dong-Hong-Beh was a warrior and leader of the army of women who served the third ruler of Dahomey, King Houegbadja. Initially, the women were brought into the army to intimidate their enemies with their large numbers. After succeeding in battle, King Houegbadja kept them as his official army. Seh-Dong-Hong-Beh went on to lead an all-female army of nearly 6,000 warriors, beheaded the chief of the enemy’s army and brought his head back to her king wrapped in the French flag. In the most gut-wrenching times of your life, there is the Black woman standing near you, fighting with you, and cheering you on. She is loyal to you and your potential. Willing to put in the work and fight alongside you to ensure that you become the true King you are. So this is the scene where Okoye had to check Nakia on where her loyalty lies. Some may say this was harsh and lacked empathy, after all Nakia just lost the love of her life and Wakanda just lost their King; but was it harsh ? 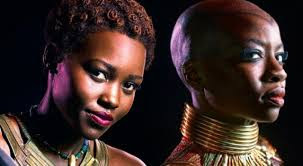 Okoye was absolutely shaken, this is undeniable, but she remained poised and focused on what was next. This scene begs the question does her loyalty stops at the death of King T’Challa? I say no, because legacy doesn’t die. Black man, you should be walking in your gifts so much that if you die your legacy doesn't stop, you need an Okoye to walk in logic and to ensure the people who need you move forward in times of tragedy. “What are you loyalty to?” is a rhetorical question that forces us to realize that her purpose is in your life and death. “. . . for Wakanda? without question.” she responds. She is loyal to what is in the best interest of you, even when you aren’t loyal to it yourself. It’s important to note that what is in your best interest is also what is in the best interest of the people you serve. But if you choose to go astray, she will continue to press onward even if that means you are no longer aligned, and her love for you does not supersede her love for the people you are supposed to be leading. Did we peep Okoye was in a traditional meditation pose and stance as she guided T'Challa's character back into Wakanda? Representing that a Black woman in peace can guide you to exactly where you need to be. Okoye was also the only one to realize Agent Ross (the white CIA agent), an outsider entering into their sacred land could be problematic. We don’t see anything negative come from this now, but I’m eager to see what would come in the future. Okoye was the one to bring to the counsel's attention that Klau was available for their capture. This is a big deal because he escaped their pursuits for 30 years. Furthering our point that sister girl ran the show from beginning to end. 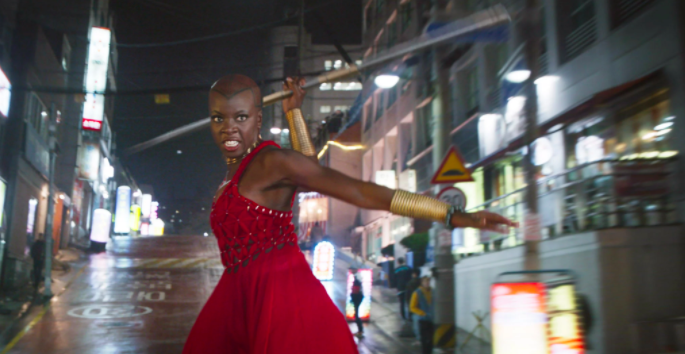 Let us hear your thoughts on Okoye and the other fiery Black Women of Wakanda below.